Day 4 of Obligatory Ice Level Day. That’s right, Day 4. 4. The DEATH NUMBER. Life can get frustrating and terrible, but occasionally there’s a way out of a bad situation. A bad situation like, say, diving head-first into spikes or falling down a bottomless pit every 30 seconds. 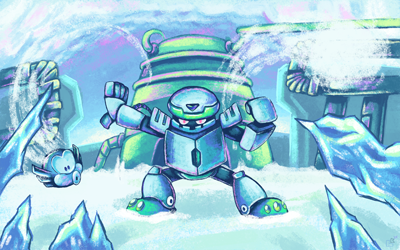 That’s why today’s ice level is Cold Man’s stage, from Rockman & Forte. So, Rockman & Forte. Rockman. And. Freaking. Forte. This game takes place between Mega Man 7 and Mega Man 8, focusing on a side story wherein a rogue robot named King starts drafting new Robot Masters into his unstoppable army. In a bit of a break with tradition, you could choose to play as either Mega Man or Bass. Mega Man naturally wants to fight for everlasting peace, but Bass is mainly just out there to prove his worth. But that’s not the real story of this game. The real story is how this game was allegedly made to appeal to young kids who didn’t yet have a Playstation and thus no means to play MM8, but somewhere along the way, the memo that read “THIS GAME IS FOR KIDS” somehow got swapped out for a paper airplane that had “IF ANYONE BEATS THIS GAME WITHIN THE NEXT 20 YEARS, I WILL MELT YOUR FAMILY INTO MEAT SAUCE AND FLING A SPOONFUL OF THEM DIRECTLY INTO YOUR FACE EVERY DAY FOR THE REST OF YOUR LIFE!! !” scrawled on it in blood. That’s the only explanation I can come up with as to why this game is just a few extra death spikes and murder-bosses away from being literally impossible. Because any other theory would just sound crazy. Cold Man’s stage is the easiest stage to tackle, in that it only has a few instantly-disappearing platforms hovering precariously over a field of spikes, only a couple of weird jumps to navigate under the threat of death, and only a few instances of fast-moving objects trying to shove you directly into endless chasms. 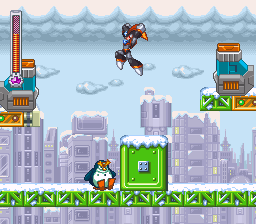 The boss, Cold Man, is also the easiest of the Robot Masters, only requiring roughly 7 thousand trillion shots to beat if you’re playing as Bass, and only needing you to shoot diagonally flying killbots that swarm you from just out of your weapon range every .29 seconds as Mega Man. Cold Man himself attacks by sliding giant ice spikes towards you, sending little floating cloud-bots that home in on you, and of course the ever-popular “leap across the room and do all that stuff on the other side of the arena” move. The ice spikes reflect your shots away from him, the cloud-bots have to be destroyed before they latch onto you and make it impossible to do anything, and the creeping sense of dread forming in the pit of your soul constantly spreads to every area of your psyche once you realize that this the easiest part of the game and there are about 80 more hours of infinitely worse things awaiting you in the rest of this disastrous adventure. Pictured above: the beginning of the end of any love or joy in your life. Get the full wallpaper here. And hey, since it’s Mega Man, of course we have music. Cold Man’s theme is really catchy, which isn’t surprising since this series is known for awesome music. Which is good because I had to farm for lives and bolts in this stage every time I died in the last levels of the game and it sort of broke my brain. And since it’s such a great song, of course there are remixes. This Cold Man remix is by r.os, this version is by BaghiraZero, this one is by Millstones, this remix is by ReduxSound, and the version on here is by Joshua Morse. Are you all keeping warm? You better! You don’t want to get sick before the next ice level goes up, after all.